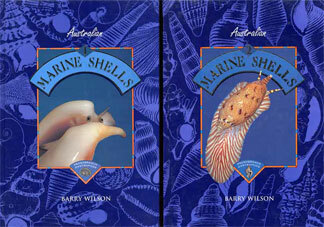 A two volume set published in 1993 that thoroughly covers the gastropod population of the Australian continent. The first volume (407 pages and 44 full color plates) covers the less evolved shells and includes the major families Strombidae, Cypraeidae, and Ranellidae. Volume 2 (370 pages with 53 full color plates) continues the coverage and includes the major families Muricidae, Volutidae and Conidae. The books are A4 size (about 8” by 11.75” page size) and hardbound in laminated board covers and they are beautifully produced. Each volume has numerous; top quality line drawings of shells that are not illustrated in the color plates, as well as maps and charts.